MICRO Macro lens. Designed specially for shooting close-ups of small subjects but can be also used in other genres of photography, not necessarily requiring focusing at close distances. Greater fine-line resolution than any other lens available for the camera. 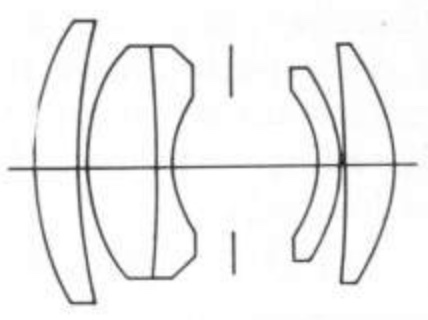 It is a development of a Petzval symmetrical formula, especially computed for extremely high acutance at comparatively short object-to-lens distances, reaching maximum at image reductions of 1:12. At very close distances, the lens mount is collapsed and a device is inserted to make aperture settings convenient.